(2015) "When We Were Young"
"Hello" is a song by British singer-songwriter Adele, released on 23 October 2015 by XL Recordings as the lead single from her third studio album, 25 (2015). Adele co-wrote the song with her producer, Greg Kurstin. "Hello" is a piano ballad with soul influences, and lyrics that discuss themes of nostalgia and regret. Upon release, the song was acclaimed by music critics, who compared it favourably to Adele's previous work and praised the song's lyrics and Adele's vocals. It was recorded in London's Metropolis Studios. "Hello" reached number one in almost every country it charted in, including the United Kingdom, where it became her second chart topper, following "Someone Like You", and has the largest opening week sales in three years. In the United States, "Hello" debuted at the top of the Billboard Hot 100, reigning for 10 consecutive weeks whilst becoming Adele's fourth number-one on the chart and breaking several records, including becoming the first song to sell over a million digital copies in a week. By the end of 2015, it had sold 12.3 million units globally (combined sales and track-equivalent streams) and was the year's 7th best-selling single while it stands as one of the best-selling singles of all-time. The accompanying music video was directed by Xavier Dolan and co-stars Adele and Tristan Wilds. The music video for the song broke the Vevo Record by achieving over 27.7 million views within a 24-hour span, held previously by Taylor Swift's "Bad Blood" which accumulated 20.1 million views in that timeframe. The record was then later broken by Swift in 2017 for the video for her song “Look What You Made Me Do” which gained over 43.2 million views in the timeframe. "Hello" also broke the record for shortest time to reach one billion YouTube views (87 days). The clip received seven nominations at the 2016 MTV Video Music Awards, including Video of the Year and Best Female Video. Adele promoted the song with a live performance on a BBC one-hour-long special, entitled Adele at the BBC. At the 59th Annual Grammy Awards, "Hello" won three Grammy Awards: Record of the Year, Song of the Year, and Best Pop Solo Performance. At the 36th Brit Awards, "Hello" won British Single of the Year and was nominated for British Video of the Year. A 21-second sample of "Hello"'s chorus, where Adele is singing the lines over layers of backing vocals, piano and drums "towards a very luscious wall of sound". "Hello" was written by Adele and Greg Kurstin and produced by the latter. Kurstin also played bass, guitar, drums, piano and keyboards, while Adele also played drums. "Hello" was written in Chiswick, London, something not normally done by Adele, who said she likes to write her music at home. The writing process for the song was slow, taking six months to complete. Initially Adele and Kurstin started writing the first verse; finishing half of the song, six months later Adele contacted Kurstin to finish the song with her, with Kurstin stating he was not sure "if Adele was ever going to come back and finish it." "Hello" is a soul piano ballad, played in the key of F minor at a tempo of 79 beats per minute. The repeated chord progression heard in the verse, played by the piano, follows two progressions and a passage progression(passage progression connects two progressions to each other) of Progression #1: Fm(i)–A♭(III)–E♭(VII)–D♭(VI),Passage progression: Fm(i)–E♭(VII)-Cm(v)-D♭(VI)-Fm(i)-E♭(VII)–D♭(VI),Progression #2:Fm(i)–D♭/F(VI)–A♭(III)–E♭(VII). According to Musicnotes.com, Adele's vocals span from F3 to A♭5 in the song. During the chorus, Adele is heard singing the lines over layers of backing vocals, piano and drums which were described by The Daily Telegraph as having "a very luscious wall of sound". Lyrically, the song focuses on themes of nostalgia and regret and plays out like a conversation. The song was noted for containing themes of regret and was seen as a follow-up to her single "Someone like You" appearing to reflect on a failed relationship. The song's lyrics were also seen as being conversational, revolving around "all the relationships of her past", ranging from friends, family members and ex-partners. Speaking on the song's lyrical content, Adele told Nick Grimshaw on The Radio 1 Breakfast Show: "I felt all of us were moving on, and it's not about an ex-relationship, a love relationship, it's about my relationship with everyone that I love. It's not that we have fallen out, we've all got our lives going on and I needed to write that song so they would all hear it, because I'm not in touch with them." According to Adele, the line "Hello from the other side" signifies "the other side of becoming an adult, making it out alive from your late teens, early twenties." On 18 October 2015, a 30-second clip of "Hello" was played during a commercial break on The X Factor in the United Kingdom. The commercial teased what was then new material, with her vocals accompanied by lyrics on a black screen. Josh Duboff of Vanity Fair wrote that "the Internet collectively lost its mind" after the broadcast of the trailer. On 22 October, Adele announced the upcoming release of 25 to her fans on Twitter. She also shared that "Hello" would be released on 23 October as the lead single off of the album. On 23 October, Adele joined Nick Grimshaw's show on BBC Radio 1 for the song's premiere. Alexis Petridis of The Guardian described it as "a big ballad, but a superior example of its kind", and opined that the song is "precisely the kind of lovelorn epic ballad that made Adele one of the biggest stars in the world." Writing for The Independent, Emily Jupp stated in her review of the song that it "might not be groundbreaking, but Adele's return with her familiar, smoky sound is very welcome". She called it an "'if it ain't broke' ballad" and said: "Adele does what she does best, belting out emotional tales of love and loss much the same as with her last album, 21, but this time, with a little more self-forgiveness." Greg Kot of the Chicago Tribune wrote: "Lyrics that work best when they zoom in on personal details match her combination of vocal power and restraint." Neil McCormick from The Daily Telegraph called it "a beautiful song of loss and regret", adding that "it takes a grip on the kind of memory every listener holds somewhere in their heart and merges it with Adele's own drama." Rolling Stone ranked "Hello" at number 6 on its year-end list to find the 50 best songs of 2015. Several publications have commented on similarities in the theme of the song and accompanying video with that of "Hello" by American singer Lionel Richie. Three days after its release, the Official Charts Company announced that "Hello" had accumulated 165,000 chart sales in the United Kingdom, of which 156,000 were downloads. "Hello" entered at the top of the UK Singles Chart on 30 October 2015, – for the week dated 5 November 2015 – with 333,000 combined sales, of which 259,000 were downloads, making it the biggest selling number-one single on the chart in three years. It marked Adele's second UK number-one single, after 2011's "Someone like You". Additionally, "Hello" was streamed 7.32 million times in its first week, breaking the streaming record previously held by Justin Bieber's "What Do You Mean?". Including streaming sales and excluding The X Factor and Pop Idol winners' singles, major charity campaign records and Christmas number ones, "Hello" was the second biggest selling number one of the 21st century in the UK, beaten only by Shaggy's "It Wasn't Me", which sold 345,000 copies in a week in February 2001. The following week, the song remained at number one after selling a further 121,000 downloads and was streamed 5.78 million times, the same week the song was certified Gold by the BPI. On 20 May 2016, it spent its 30th week in the UK Top 100. As of November 2016, the song has sold 918,700 in pure sales. The song also debuted at number one in Belgium, Czech Republic, France, Germany, Greece, Hungary, Ireland, Israel, Italy, Lebanon, Luxembourg, The Netherlands, Norway, Portugal, Scotland, Slovakia, Spain and Switzerland. In Australia, "Hello" entered at the top of the ARIA Singles Chart on 31 October 2015, selling over 59,075 units, which earned the song a gold certification in its first week. The song also became the second fastest-selling single of the year, behind Wiz Khalifa's "See You Again". It marked Adele's second number-one single on the ARIA Singles Chart following 2011's "Someone like You". The single stayed atop the chart for a second week and was certified platinum selling over 70,000 units. On 20 March 2017, Hello re-entered the chart at number 50 and has so far been certified 7x platinum for sales over 490,000 units. In New Zealand, the song debuted at number one on the New Zealand singles chart, holding the position the following week and was certified platinum. In the United States, "Hello" debuted at the top of the Billboard Hot 100 on 2 November 2015, for the chart dated 14 November 2015, becoming only the 24th song to debut at number one. "Hello" started at number 49 on the Radio Songs chart, after three days of release. In its first full week of airplay, it rose from 45 to 9, up 146% to 70 million all format audience impressions. The track started at number one on the On-Demand Songs chart with a record 20.4 million on-demand streams, becoming her first number-one song on the chart. "Hello" entered at the top of the Digital Songs chart with sales of 1,112,000, becoming the first track to sell over one million digital copies in a single week and almost doubling the record for the most downloads sold in a week, previously held by Flo Rida's "Right Round", which sold 636,000 downloads in the week ending 28 February 2009. "Hello" started with 61.6 million US streams, becoming her first number-one song and the second greatest weekly total on the Streaming Songs chart, behind Baauer's "Harlem Shake", which registered 103 million streams on week of 3 March 2013. "Hello" is the first song to sell more than a million digital copies in a single week and the third highest weekly sales total since Nielsen SoundScan began tracking sales in 1991. Only Elton John's "Candle in the Wind 1997/Something About the Way You Look Tonight" has sold more in a single week, selling 3.446 million copies in its opening week and 1.212 million copies in its second week. In its second week, "Hello" stayed at number one on the US Billboard Hot 100, selling another 635,000 digital copies marking the third-best digital sales week and the highest for a non-debut week. "Hello" also held atop Streaming Songs with 47.4 million US streams, down 23 percent from 61.6 million in its first week, the track also stayed atop the On-Demand Songs with 18.1 million streams. On the Radio Songs chart, "Hello" moved from 9 to 6, up by 46% to 106 million all-format audience impressions, thus becoming the top Airplay Gainer on the Hot 100. The track also moved from two to one on the Adult Alternative Songs airplay chart and moved nine to four on the Adult Contemporary format. The following week, the song stayed at the top of the Hot 100 and Digital Songs chart, selling 480,000 downloads and becoming just the third song to sell over 400,000 copies for three straight weeks. "Hello" also rose from 6 to 1 on the Radio Songs chart in just its fourth week (the greatest leap to number one on the chart's 25-year history), marking the quickest climb to number one on the chart in 22 years, since Mariah Carey's "Dreamlover" reached the top in its fourth frame on 28 August 1993. Additionally, "Hello" became just the third song to top the Hot 100, Digital Songs, Streaming Songs, On-Demand Songs and Radio Songs tallies simultaneously in the nearly three years all five charts had coexisted. "Hello" remained atop the Hot 100 for ten consecutive weeks, becoming only the 31st No. 1 in the Hot 100's history to reign for at least 10 weeks, and only the 3rd for a number one debut, following "One Sweet Day" by Mariah Carey and Boyz II Men (16 weeks) and "Candle in the Wind 1997/Something About the Way You Look Tonight" by Elton John (14 weeks). By spending a tenth week at the top of the chart, it became Adele's longest-running number-one single and the longest-leading Hot 100 No. 1 by a solo female since Rihanna's "We Found Love," featuring Calvin Harris, which also led for 10 weeks in 2011–2012. As of January 2016, it had sold 3.7 million downloads. The Recording Industry Association of America certified the song quadruple platinum. The single also benefitted from numerous Dance/EDM remixes as well, thus resulting in "Hello" topping Billboard's Dance Club Songs and Dance/Mix Show Airplay charts. On the chart dated 23 April 2016, the song spent a 21st week at the top of the Adult Contemporary Chart, matching the record set by Kelly Clarkson's "Breakaway" (2005) and Celine Dion's "A New Day Has Come" (2002) for the longest No. 1 run among women since the list launched in 1961. It also equaled the third-longest stay at the summit among all acts. "Hello" debuted at number one on the Canadian Hot 100 on 3 November 2015, for the chart dated 14 November 2015, selling 140,000 copies and outsold Justin Bieber's "Sorry", which sold 40,000 units the same week. The song was streamed 4.79 million times in its first week, setting a record for the most streamed track in a single week in Canada. "When I heard the song I saw a story right away. [The video] is highly unoriginal. The lyrics are 'Hello, it's me' and then you see someone picking up a phone. I'm not good at imagining super conceptual videos. I just thought it would be nice to have her walk around the house and make phone calls and end up in a forest, with maybe some flashbacks in it." The accompanying music video for the song was directed by Canadian actor and director Xavier Dolan and released on 22 October 2015, despite the fact the song was released as a single a day later. The concept of the video revolves around a recently broken-up woman calling a younger version of herself. Portions of the video—mostly the finale on the pond and the shot of her opening her eyes in the beginning—were filmed with IMAX cameras, making it the first music video in IMAX format. The video draws inspiration from Dolan's semi-autobiographical debut I Killed My Mother, which was made when Dolan was barely 20. The video was filmed on a farm in Québec over 4 days in September 2015. The video stars American actor Tristan Wilds. According to Dolan, Adele called him after an unspecified incident of police brutality in the United States, suggesting that a Caucasian male not be cast as her love interest in the video. Dolan elaborated "She was just like, 'I’m concerned with the reality of the tensions between authorities and the black community, and I want to send a message out there.'" Dolan contacted Wilds via Skype and explained the concept for the video, which Wilds agreed to take part in. During the filming, both Adele and Wilds were asked to improvise and "tap into" their past relationships in order to convey the correct emotions. Dolan also filmed shots of both Adele and Wilds having conversations and laughing. The sepia toned video shows Adele performing the song in a small house and outside in a wooded forest, intercut with scenes of her making a tearful phone call and flashbacks to a past relationship with Wilds' character. The flip phone used by Adele in the video was widely commented upon due to being of a retro style. Dolan replied to the remarks by saying: "It makes me uncomfortable filming iPhones because I feel like I'm shooting a commercial. Those things: iPhones, laptops, all those elements, to me, they bring me back to reality: That's not what you want. You want to get out of your own life; you want to enter someone else's; you want to travel somewhere; you want to be told a story. I'm realizing maybe I've been more distracting than anything else with that flip phone, but it wasn't intentional!" The music video for the song broke the previous Vevo Record by achieving over 27.7 million views within a 24-hour period. Later, the video continued to break Miley Cyrus's "Wrecking Ball" Vevo record for the fastest video to reach 100 million views in 5 days. The phrase "Adele hello" was also the top YouTube search term of Friday and Saturday, and on average the video was getting one million views per hour during the first two days, peaking at 1.6 million in a single hour, beating the peak view rate of the trailer for Star Wars: The Force Awakens, which peaked at 1.2 million views per hour. The video was parodied in a Thanksgiving-themed skit on Saturday Night Live. As of March 2019, the video is the 17th most viewed video on YouTube, having earned over 2.5 billion views. The video also became the third video on YouTube to reach 10 million likes on 29 May 2016, and has over 14 million likes as of March 2019, ranking it sixth on the list of most-liked YouTube videos. The five videos to have more likes are "Gangnam Style", "See You Again", "Despacito", "Shape of You" and "Faded". Adele performed "Hello" live for the first time for a BBC one-hour-long special, Adele at the BBC, which was recorded on 2 November 2015 and was broadcast on BBC One on 20 November 2015. She also performed the song at the 17th NRJ Music Awards on 7 November 2015, at Radio City Music Hall in New York City on 17 November 2015 as her opening number (Adele Live in New York City), and on Saturday Night Live on 21 November 2015. On 23 November 2015, after appearing on The Tonight Show Starring Jimmy Fallon, Adele recorded the song with Fallon and his house band, The Roots, playing classroom instruments. The version was broadcast on the show the following night. On 13 December 2015 Adele performed "Hello" on the X Factor live final at The SSE Arena, Wembley. On 9 November 2015, British singer Rita Ora delivered her own version of the song by singing it in a self-invented language in the Capital FM studios. American singer Demi Lovato covered "Hello" at the 2015 106.1 KISS FM Fall Ball in Seattle on 14 November 2015. Her rendition of the song was met with high critical acclaim. It eventually received a nomination for "Best Cover Song" at the 3rd iHeartRadio Music Awards. A fan video of Lovato's cover version has since garnered over 13.5 million views on YouTube. In December 2015, Washington, D.C.-based go-go band Backyard Band released a cover version of the song, which has become widely popular in the area since its release. During New Year's Eve 2015, Canadian singer Celine Dion put her own spin on "Hello" at her residency show in Las Vegas. On 5 January 2016, Canadian indie rock band Walk off the Earth released a video cover version of the song, featuring KRNFX and the use of Whippy Tubes  and later, on 19 January 2016, the band released an alternative video cover version of the song featuring dancers Myles Erlick and Isaac Lupien from the Canadian drama show The Next Step. The American DJ Marshmello released a house remix on his SoundCloud on 14 April 2016. The song was mentioned in the season 6 premier episode of 2 Broke Girls. "Hello" is also referenced in the Lady Leshurr single "Queen's Speech 5" and was also sampled in Stitches' single "One Million Dimes". ^ a b Adkins, Adele (2015). 25 (Booklet). Adele. London, England, U.K.: XL Recordings. pp. 12–13. 88875176782. ^ a b "Adele – "Hello" Video". Stereogum. Retrieved 2 November 2015. ^ "Global Music Report" (PDF). International Federation of the Phonographic Industry. Retrieved 12 April 2016. ^ "Beyonce, Adele Lead Nominees for 2016 MTV Video Music Awards". Billboard. Retrieved 26 July 2016. ^ a b c "Adele, 'Hello', review: 'delivers raw, honest feeling'". The Daily Telegraph. Retrieved 26 October 2015. ^ "Radio on Adele's 'Hello': 'She Can Make You Feel What She Feels'". Billboard. ^ "Adele: "My son doesn't like my music, I just sing Twinkle Twinkle"". BBC Radio 2. 23 October 2015. Retrieved 24 October 2015. ^ a b Brian Hiatt (3 November 2015). "Adele: Inside Her Private Life and Triumphant Return". Rolling Stone. Retrieved 4 November 2015. ^ "Adele's 'Hello' Rebuffs Modern Technology". Vulture. Retrieved 2 November 2015. ^ "Hello By Adele – Digital Sheet Music". musicnotes.com. Musicnotes, Inc. Retrieved 26 October 2015. ^ Lewis Corner. "Adele's new single first listen review: 'Hello' is a mighty comeback". Digital Spy. ^ Rachael Bletchly (23 October 2015). "Adele: Fame is toxic and touring is lonely...people have paid to see me but what if they don't like me". mirror. Retrieved 25 October 2015. ^ "Adele 'teases new material in TV advert'". BBC News. Retrieved 26 October 2015. ^ Josh Duboff. "Adele's Mysterious New Teaser Has Stymied a Planet". Vanity Fair. ^ "Adele reveals the release date for her third studio album, 25, and new single". BBC. 22 October 2015. Retrieved 22 October 2015. ^ a b Geslani, Michelle. "Adele confirms new album is titled 25, first single coming next week". Consequence of Sound. Retrieved 25 October 2015. ^ Hunt, Chase. "Adele announces new album '25'; new single 'Hello' out Oct. 23". AXS. Retrieved 25 October 2015. ^ "Adele premieres 'intimate' new song". BBC News. Retrieved 26 October 2015. ^ "BBC Radio 1 – The Radio 1 Breakfast Show with Nick Grimshaw, Adele Is in the Building With Her New Song, Adele tears up introducing her new song 'Hello' on BBC Radio 1". BBC. ^ Petridis, Alexis (23 October 2015). "Striking, witty and lovelorn – Adele's new single Hello reviewed (and hear it here, too)". The Guardian. Retrieved 23 October 2015. ^ Jupp, Emily (23 October 2015). "Adele 'Hello', first review: This is an 'if it ain't broke' ballad showing what Adele does best". The Independent. Retrieved 23 October 2015. ^ Kot, Greg (23 October 2015). "Adele's new song 'Hello' a safe balancing act". Chicago Tribune. Retrieved 23 October 2015. ^ "50 Best Songs of 2015". Billboard.com. ^ Horton, Helena (26 October 2015). "Lionel Richie responds to Adele's 'Hello'". The Daily Telegraph. Retrieved 27 October 2015. ^ "Lionel Richie responds on Instagram to Adele 'Hello' music video mash-up". Radio Times. ^ "Adele heads straight to number one". BBC News. ^ Copsey, Rob (30 October 2015). "Adele smashes Official Chart records with comeback single Hello". Official Charts Company. Retrieved 30 October 2015. ^ Myers, Justin (6 November 2015). "Adele says Hello to another week at Number 1". Official Charts Company. ^ Myers, Justin (26 November 2016). "Adele's 25 one year on: 14 incredible chart facts". Official Charts Company. Retrieved 26 November 2016. ^ Daw, Robble (2 November 2015). "Adele's "Hello" Debuts At #1, Sells Jaw-Dropping 1.1 Million US Downloads In First Week". Retrieved 11 November 2015. ^ a b Maricris Faderugao (3 November 2015). "Adele's 'Hello' hits platinum in Australia as she prepares for a one-off televised concert". International Business Times AU. ^ Gavin, Ryan (31 October 2015). "Adele says 'Hello' to the No. 1 spot". ARIA Charts. Retrieved 2 November 2015. ^ "Adele's "Hello" Debuts At #1, Sells Jaw-Dropping 1.1 Million US Downloads In First Week". Music News, Reviews, and Gossip on Idolator.com. ^ Trust, Gary (2 November 2015). "Adele Says "Hello" to No. 1 Debut, First Song To Sell 1 Million Downloads in a Week". Billboard. Retrieved 2 November 2015. ^ Gary Trust & Keith Claufield (4 November 2015). "Adele's 'Hello' Has Biggest Sales Week for a Single Since Elton John's Princess Diana Tribute in 1997". Billboard. Retrieved 5 November 2015. ^ Gary Trust (9 November 2015). "Adele's 'Hello' Tops Hot 100 for Second Week; Ariana Grande, Meghan Trainor Hit Top 10". Billboard. Retrieved 9 November 2015. ^ Trust, Gary (4 January 2016). "Adele's 'Hello' Tops Hot 100 for 10th Week as Twenty One Pilots Fly to Top 10". Billboard. Retrieved 4 January 2016. ^ a b "American single certifications – Adele – Hello". Recording Industry Association of America. Retrieved 9 November 2017. If necessary, click Advanced, then click Format, then select Single, then click SEARCH. ^ Medved, Matt. "Remix Roundup: Listen to 6 Must-Hear Remixes of Adele's 'Hello' Right Now". Billboard. Retrieved 26 November 2015. ^ Murray, Gordon. "Adele Says 'Hello' to Dance Charts Thanks to New Remixes". Billboard. Retrieved 12 November 2015. ^ Murray, Gordon. "Adele's 'Hello' Is Now a No. 1 Dance Hit, Too". Billboard. Retrieved 3 December 2015. ^ Trust, Gary (11 April 2016). "Adele's 'Hello' Ties Longest Reign on AC Chart by a Woman". Billboard. Prometheus Global Media. Retrieved 11 April 2016. ^ Cross, Alan (2 November 2015). 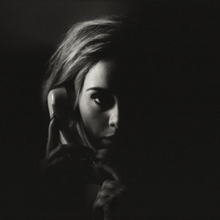 "Adele's "Hello" ANNIHILATES the Competition in Its First Week. It's Not Even Close". A Journal of Musical Things. Retrieved 3 November 2015. ^ a b c d Steven Zeitchik (23 October 2015). "Director of Adele's 'Hello' video explains its look, theme and, oh yes, flip phone". Los Angeles Times. Retrieved 25 October 2015. ^ "Adele enlists Xavier Dolan for new music video Hello". CBC News. 22 October 2015. Retrieved 23 October 2015. ^ Spanos, Brittany (22 October 2015). "Adele Unveils '25' Track List, Plans 'Hello' Video". Rolling Stone. Retrieved 22 October 2015. ^ Rosen, Christopher (23 October 2015). "Adeles's powerful 'Hello' Video Already Made History". Entertainment Weekly. Retrieved 23 October 2015. ^ Buchanan, Kyle (8 December 2016). "Xavier Dolan on Blink-182, Bottoming, and Being the World's Biggest Kate Winslet Fan". Vulture.com. Retrieved 17 February 2017. ^ "Adele cast black star in Hello video to address 'police brutality'". The Guardian. 10 December 2016. Retrieved 17 February 2017. ^ a b "Tristan Mack Wilds on Adele's Hello". Entertainment Weekly's EW.com. ^ Tyrrell, Rebecca (23 October 2015). "The guy in Adele's new music video might look familiar to you". Metro. Retrieved 23 October 2015. ^ "'Hello' Music Director Explains Why Adele Uses That Flip Phone". The Huffington Post. Retrieved 10 November 2015. ^ Groves, Nancy (27 October 2015). "Adele's Hello beats Taylor Swift's record for most-viewed video in 24 hours". The Guardian. ^ Bacardi, Francesca (29 October 2015). "Adele's "Hello" Music Video Shatters Miley Cyrus' Vevo Record". E!. ^ "People are playing Adele one million times an hour on YouTube". BBC. ^ "Adele saves awkward Thanksgiving dinner in SNL parody". Entertainment Weekly. 22 November 2015. Retrieved 14 July 2016. ^ "Most Viewed Videos of All Time (Over 450M views)". YouTube. Retrieved 28 December 2015. ^ "Adele – Hello". YouTube. Retrieved 28 December 2015. ^ McIntyre, Hugh. "Adele's 'Hello' Hits 2 Billion Views On YouTube". Forbes. Retrieved 11 October 2017. ^ "Kworb – Most Liked music videos". BBC. Retrieved 18 December 2017. ^ "BBC Music – BBC Music – *Exclusive* Adele at the BBC, a first look – When Adele met Graham Norton, featuring Hello (live)". BBC. ^ "Adele to film BBC One special with Graham Norton". BBC News. ^ "Adele Sing 'Hello' at France's NRJ Awards – Billboard". Billboard. ^ "Adele at Radio City Music Hall: A Moment of Beauty at a Time of Unrest". The Huffington Post. 18 November 2015. ^ Lisa Respers France, CNN (25 November 2015). "Adele kills it on 'The Tonight Show' with Jimmy Fallon". CNN. ^ Williott, Carl (14 December 2015). "Watch Adele Perform 'Hello' On 'X Factor UK'". Music News, Reviews, and Gossip on Idolator.com. Retrieved 31 January 2016. ^ "WATCH: Rita Ora Covered Adele's Hello' In Her OWN Language". Capital. Global Radio. 9 November 2015. Retrieved 5 April 2016. ^ Robinson, Joanna (15 November 2015). "Watch Demi Lovato's Raw and Powerful Cover of Adele's "Hello"". Vanity Fair. Condé Nast. Retrieved 5 April 2016. ^ Peters, Mitchell (15 November 2015). "Watch Demi Lovato Passionately Cover Adele's 'Hello'". Billboard. Prometheus Global Media. Retrieved 5 April 2016. ^ Karlin, Lily (15 November 2015). "Demi Lovato Absolutely Slays Cover Of Adele's 'Hello'". The Huffington Post. Retrieved 5 April 2016. ^ Lynch, Joe (9 February 2016). "iHeartRadio Music Awards Announce 2016 Nominees, Performers & New Categories". Billboard. Prometheus Global Media. Retrieved 5 April 2016. ^ Riley Baltazar (15 November 2015). "Demi Lovato Covers Adele's "Hello" – Seattle's Fall Ball". YouTube. Google. Retrieved 5 April 2016. ^ Richards, Chris (4 February 2016). "What a viral cover of Adele's 'Hello' means for go-go". The Washington Post. Retrieved 9 May 2016. ^ Strecker, Erin (1 January 2016). "Watch Celine Dion's Perfect Cover of Adele's 'Hello'". Billboard. Prometheus Global Media. Retrieved 5 April 2016. ^ "Walk off the Earth News". Retrieved 6 May 2018. ^ "Hello Cover". Retrieved 6 May 2018. ^ "Hello (Tap Dance Cover with Myles & Isaac)". Retrieved 6 May 2018. ^ "Adele - Hello (Marshmello Remix)". SoundCloud. 14 April 2016. Retrieved 18 December 2018. ^ "Australian-charts.com – Adele – Hello". ARIA Top 50 Singles. Retrieved 31 October 2015. ^ "Austriancharts.at – Adele – Hello" (in German). Ö3 Austria Top 40. Retrieved 4 November 2015. ^ "Ultratop.be – Adele – Hello" (in Dutch). Ultratop 50. Retrieved 31 October 2015. ^ "Ultratop.be – Adele – Hello" (in French). Ultratop 50. Retrieved 31 October 2015. ^ "Hot 100 Billboard Brasil – weekly". Billboard Brasil. 26 January 2016. Archived from the original on 16 July 2016. Retrieved 27 January 2016. ^ "Adele Chart History (Canadian Hot 100)". Billboard. Retrieved 3 November 2015. ^ "Chart Search". Billboard Canada AC for Adele. Retrieved 29 October 2015. ^ "Chart Search". Billboard Canada CHR/Top 40 for Adele. Retrieved 29 October 2015. ^ "Chart Search". Billboard Canada Hot AC for Adele. Retrieved 29 October 2015. ^ "ČNS IFPI" (in Czech). Hitparáda – Radio Top 100 Oficiální. IFPI Czech Republic. Note: Change the chart to CZ – RADIO – TOP 100 and insert 201549 into search. Retrieved 30 November 2015. ^ "ČNS IFPI" (in Czech). Hitparáda – Digital Top 100 Oficiální. IFPI Czech Republic. Note: Change the chart to CZ – SINGLES DIGITAL – TOP 100 and insert 201544 into search. Retrieved 2 November 2015. ^ "Danishcharts.com – Adele – Hello". Tracklisten. Retrieved 11 November 2015. ^ "Euro Digital Songs". Billboard. Retrieved 31 October 2015. ^ "Europe Official Top 100". Retrieved 23 November 2015. ^ "Adele: Hello" (in Finnish). Musiikkituottajat – IFPI Finland. Retrieved 8 November 2015. ^ "Lescharts.com – Adele – Hello" (in French). Les classement single. Retrieved 30 October 2015. ^ "Offiziellecharts.de – Adele – Hello". GfK Entertainment Charts. Retrieved 30 October 2015. ^ "Greece Digital Songs". Billboard. Retrieved 31 October 2015. ^ "Airplay Chart" (in Greek). International Federation of the Phonographic Industry. Archived from the original on 17 December 2015. ^ "Archívum – Slágerlisták – MAHASZ" (in Hungarian). Rádiós Top 40 játszási lista. Magyar Hanglemezkiadók Szövetsége. Retrieved 11 December 2015. ^ "Archívum – Slágerlisták – MAHASZ" (in Hungarian). Single (track) Top 40 lista. Magyar Hanglemezkiadók Szövetsége. Retrieved 30 October 2015. ^ "Chart Track: Week 44, 2015". Irish Singles Chart. Retrieved 31 October 2015. ^ "Adele – Hello Media Forest". Israeli Airplay Chart. Media Forest. Retrieved 1 November 2015. ^ "Italiancharts.com – Adele – Hello". Top Digital Download. Retrieved 30 October 2015. ^ "Adele Chart History (Japan Hot 100)". Billboard. Retrieved 10 December 2015. ^ "The official lebanese Top 20 – Adele". ^ "Luxembourg Digital Songs". Billboard. Retrieved 31 October 2015. ^ "Mexico Airplay: Dec 19, 2015". Billboard. Retrieved 26 December 2015. ^ "Nederlandse Top 40 – Adele" (in Dutch). Dutch Top 40. Retrieved 27 October 2015. ^ "Dutchcharts.nl – Adele – Hello" (in Dutch). Single Top 100. Retrieved 31 October 2015. ^ "Charts.nz – Adele – Hello". Top 40 Singles. Retrieved 30 October 2015. ^ "Norwegiancharts.com – Adele – Hello". VG-lista. Retrieved 30 October 2015. ^ "Listy bestsellerów, wyróżnienia :: Związek Producentów Audio-Video". Polish Airplay Top 100. Retrieved 30 November 2015. ^ "Portuguesecharts.com – Adele – Hello". AFP Top 100 Singles. Retrieved 7 January 2016. ^ "Media Forest – Weekly Charts. Media Forest. 4 January 2016. Retrieved 2 July 2018. Note: Romanian and international positions are rendered together by the number of plays before resulting an overall chart. ^ "Official Scottish Singles Sales Chart Top 100". Official Charts Company. Retrieved 30 October 2015. ^ "ČNS IFPI" (in Slovak). Hitparáda – Radio Top 100 Oficiálna. IFPI Czech Republic. Note: insert 201551 into search. Retrieved 21 December 2015. ^ "ČNS IFPI" (in Slovak). Hitparáda – Singles Digital Top 100 Oficiálna. IFPI Czech Republic. Note: Select SINGLES DIGITAL - TOP 100 and insert 201544 into search. Retrieved 2 November 2015. ^ "SloTop50: Slovenian official singles weekly chart". SloTop50. Retrieved 5 June 2015. ^ "EMA Top 10 Airplay: Week Ending 2015-11-10". Entertainment Monitoring Africa. Retrieved 11 November 2015. ^ "Gaon International Chart – Week 45, 2015" (in Korean). Gaon Music Chart. Retrieved 31 October 2015. ^ "Spanishcharts.com – Adele – Hello" Canciones Top 50. Retrieved 4 November 2015. ^ "Swedishcharts.com – Adele – Hello". Singles Top 100. Retrieved 7 November 2015. ^ "Swisscharts.com – Adele – Hello". Swiss Singles Chart. Retrieved 1 November 2015. ^ "Official Singles Chart Top 100". Official Charts Company. Retrieved 30 October 2015. ^ "Official Independent Singles Chart Top 50". Official Charts Company. Retrieved 30 October 2015. ^ "Adele Chart History (Hot 100)". Billboard. Retrieved 2 November 2015. ^ "Adele Chart History (Adult Alternative Songs)". Billboard. Retrieved 24 November 2015. ^ "Adele Chart History (Adult Contemporary)". Billboard. Retrieved 17 November 2015. ^ "Adele Chart History (Adult Pop Songs)". Billboard. Retrieved 24 November 2015. ^ "Adele Chart History (Adult R&B Songs)". Billboard. Retrieved 24 November 2015. ^ "Adele Chart History (Dance Club Songs)". Billboard. Retrieved 15 December 2015. ^ "Adele Chart History (Dance Mix/Show Airplay)". Billboard. Retrieved 1 December 2015. ^ "Adele Chart History (Latin Pop Songs)". Billboard. Retrieved 26 December 2015. ^ "Adele Chart History (Pop Songs)". Billboard. Retrieved 24 November 2015. ^ "Adele Chart History (Hot R&B/Hip-Hop Airplay)". Billboard. Retrieved 14 June 2017. ^ "Adele Chart History (Rhythmic)". Billboard. Retrieved 29 December 2015. ^ "Adele Chart History (Rock Airplay)". Billboard. Retrieved 14 June 2017. ^ "ARIA Charts – End of Year Charts – Top 100 Singles 2015". Australian Recording Industry Association. Retrieved 6 January 2016. ^ "JAHRESHITPARADE SINGLES 2015". austriancharts.at. Archived from the original on 4 January 2016. Retrieved 6 January 2016. ^ "Jaaroverzichten 2014". Ultratop. Retrieved 6 January 2016. ^ "Rapports annuels 2014". Ultratop. Retrieved 6 January 2016. ^ "Canadian Hot 100 : Year End 2015". Billboard. Prometheus Global Media. Retrieved 10 December 2015. ^ "TRACK TOP-100 2015". Tracklisten. Archived from the original on 26 January 2016. Retrieved 6 January 2016. ^ "Összesített singles- és válogatáslemez-lista – eladási darabszám alapján – 2015". Mahasz. Retrieved 15 January 2017. ^ "best of 201". IRMA. Retrieved 16 January 2016. ^ "Yearly Charts" (in Hebrew). Media Forest. Retrieved 16 January 2016. ^ "Classifiche 'Top of the Music' 2015 FIMI-GfK: La musica italiana in vetta negli album e nei singoli digitali" (in Italian). Federazione Industria Musicale Italiana. Retrieved 13 January 2016. ^ "Top 100 –Jaaroverzicht van 2015". Dutch Top 40. Retrieved 6 January 2016. ^ "JAAROVERZICHTEN – SINGLE 2015". Single Top 100. Archived from the original on 14 January 2016. Retrieved 6 January 2016. ^ "Top Selling Singles of 2015". Recorded Music NZ. Retrieved 25 December 2015. ^ "International Digital Chart" (in Korean). Gaon Music Chart. Retrieved 6 July 2016. ^ "Jahreshitparade 2015". Schweizer Hitparade. Archived from the original on 14 January 2016. Retrieved 6 January 2016. ^ "The Official Top 40 Biggest Songs of 2015 revealed". Retrieved 4 January 2016. ^ "Hot 100 Songs Year End 2015". Billboard. Prometheus Global Media. Retrieved 9 December 2015. ^ "Adult Contemporary Songs : Year End 2015". Billboard. Prometheus Global Media. Retrieved 10 December 2015. ^ "ARIA Top 100 Singles 2016". Australian Recording Industry Association. Retrieved 6 January 2017. ^ "Ö3 Austria Top 40 – Single-Charts 2016". oe3.orf.at. Archived from the original on 28 December 2016. Retrieved 29 December 2016. ^ "Jaaroverzichten 2016". Hung Medien. Retrieved 29 December 2016. ^ "Rapports Annuels 2016". Hung Medien. Retrieved 29 December 2016. ^ "As 100 Mais Tocadas nas Rádios Jovens em 2016". Billboard Brasil (in Portuguese). 4 January 2017. Retrieved 7 September 2017. ^ "Canadian Hot 100 : Year End 2016". Billboard. Prometheus Global Media. Retrieved 8 December 2016. ^ "Track Top-100, 2016". Hitlisten.NU. Retrieved 31 December 2016. ^ "Top 100 Jahrescharts 2016". GfK Entertainment (in German). viva.tv. Retrieved 1 January 2017. ^ "Összesített singles- és válogatáslemez-lista – eladási darabszám alapján – 2016". Mahasz. Retrieved 15 January 2017. ^ "Israeli airplay yearly chart 2016". Media Forest. Retrieved 6 January 2017. ^ "Jaaroverzichten – Single 2016". Hung Medien. Retrieved 25 December 2016. ^ "Top Selling Singles of 2016". Recorded Music NZ. Retrieved 25 December 2016. ^ "SloTop50: Slovenian official year end singles chart". slotop50.si. Retrieved 31 December 2016. ^ "Schweizer Jahreshitparade 2016 – hitparade.ch". Hung Medien. Archived from the original on 2 February 2017. Retrieved 2 January 2017. ^ "End of Year Singles Chart Top 100 – 2016". Official Charts Company. Retrieved 31 December 2016. ^ "Hot 100 Songs – Year-End 2016". Billboard. Billboard. Retrieved 8 December 2016. ^ "Adult Contemporary Songs – Year-End 2016". Billboard. Billboard. Retrieved 8 December 2016. ^ "Adult Pop Songs – Year-End 2016". Billboard. Billboard. Retrieved 8 December 2016. ^ "Pop Songs – Year-End 2016". Billboard. Billboard. Retrieved 8 December 2016. ^ "Hot Dance Club Songs – Year-End 2016". Billboard. Retrieved 4 December 2016. ^ "ARIA Charts – Accreditations – 2016 Singles". Australian Recording Industry Association. Retrieved 23 July 2016. ^ "Ultratop − Goud en Platina – singles 2016". Ultratop. Hung Medien. Retrieved 6 June 2016. ^ "Canadian single certifications – Adele – Hello". Music Canada. Retrieved 5 December 2017. ^ "Danish single certifications – Adele – Hello". IFPI Denmark. Retrieved 9 January 2018. Scroll through the page-list below until year 2018 to obtain certification. ^ "Gold-/Platin-Datenbank (Adele; 'Hello')" (in German). Bundesverband Musikindustrie. Retrieved 16 December 2015. ^ "Italian single certifications – Adele – Hello" (in Italian). Federazione Industria Musicale Italiana. Retrieved 17 October 2016. Select "2016" in the "Anno" drop-down menu. Select "Hello" in the "Filtra" field. Select "Singoli online" under "Sezione". ^ "New Zealand single certifications – Adele – Hello". Recorded Music NZ. Retrieved 5 February 2016. ^ "Spanish single certifications – Adele – Hello" (in Spanish). Novedades y Listas Oficiales de Ventas de Música en España. Retrieved 1 March 2016. ^ "Guld- och Platinacertifikat" (in Swedish). IFPI Sweden. Retrieved 8 May 2016. Type Adele in the top right search bar. Click on "Sok" and select "Visa" under Hello to see certification. "Gaon Chart: Online download (Foreign) – 2015 Year-End Chart". Gaon Chart. Korea Music Content Industry Association. Retrieved 19 December 2015. "Gaon Chart: Online download (Foreign) – 2016 Year-End Chart" (in Korean). Korea Music Content Industry Association. Retrieved 4 August 2016. "Gaon Chart: Online download (Foreign) – 2017 Year-End Chart". Gaon Chart. Korea Music Content Industry Association. Retrieved 12 January 2018. ^ "The Official Swiss Charts and Music Community: Awards (Adele; 'Hello')". IFPI Switzerland. Hung Medien. Retrieved 5 February 2016. ^ "British single certifications – Adele – Hello". British Phonographic Industry. Retrieved 9 June 2017. Select singles in the Format field. Select Platinum in the Certification field. Type Hello in the "Search BPI Awards" field and then press Enter. ^ "Adele – Hello Radiodate". radioairplay.fm. 23 October 2015. Retrieved 25 October 2015. ^ "Hot/Modern/AC Future Releases". allaccess.com. 23 October 2015. Retrieved 25 October 2015. ^ "Top 40 Mainstream > Future Releases". allaccess.com. 23 October 2015. Retrieved 25 October 2015. This page was last edited on 21 April 2019, at 21:17 (UTC).